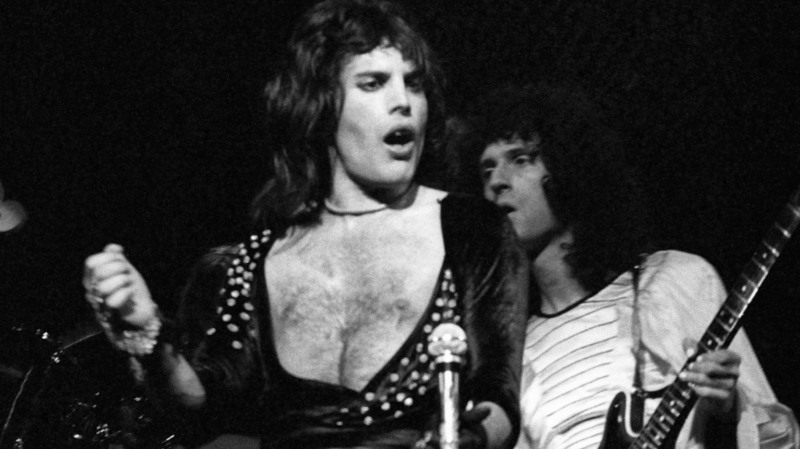 Asteroid Named For Freddie Mercury Is Announced On His Birthday : The Two-Way The celestial body was discovered in the same year Mercury died at age 45. It was dedicated to the singer in honor of what would have been his 70th birthday, his bandmate Brian May announced. Freddie Mercury is seen here performing with Queen bandmate Brian May. This week, May announced that an asteroid has been named in Mercury's honor. "It's just a dot of light, but it's a very special dot of light." That's how Queen guitarist Brian May describes the asteroid named for his late friend and bandmate Freddie Mercury. Official designation: Asteroid 17473 Freddiemercury. "Happy Birthday Freddie!" May wrote on Twitter. "They already named a planet after you, but this little ROCK is a bonus! ha ha." The celestial body was discovered in the same year Mercury died at age 45. It was dedicated to the singer in honor of what would have been his 70th birthday, in a move that May announced in a video shown at a party for Mercury's Sept. 5 birthday in Montreux, Switzerland. "Viewed from the Earth it is more than 10,000 times fainter than you can see by eye," May says, "so you need a fair-sized telescope to see it ... and that's why it wasn't discovered until 1991." The official citation includes Mercury's birth name — Farrokh Bulsara — and says of the pop star, "His distinctive sound and large vocal range were hallmarks of his performance style, and he is regarded as one of the greatest rock singers of all time." This is the second asteroid to be named for a Queen member: May — who went on to a career as an astrophysicist after the band's heyday — was honored with his own asteroid back in 2008. Mercury's asteroid orbits the sun on a path between Mars and Jupiter. Before it got a new name, it was called asteroid 1991 FM3, with the number 17473. It measures around 2 miles across, May wrote. May also thanked U.S. astronomer Joel Parker of the Southwest Research Institute for his help in getting an asteroid named for the singer. "The Beatles have asteroids, Jimi Hendrix has an asteroid, I thought for sure Freddie Mercury would have one," Parker says, according to the Daily Camera. "I brought it up with Brian, and he thought it was a great idea." May quotes Parker as saying, "even if you can't see Freddiemercury leaping through the sky, you can be sure he's there — 'floating around in ecstasy', as he might sing — for millennia to come."